Captain Roy Chipolina says Gibraltar are hoping for an action replay on Sunday having watched re-runs of their historic moment against Scotland. 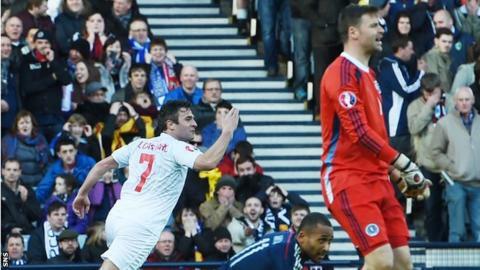 Uefa's newest members recorded their first competitive goal in their 6-1 defeat at Hampden in March. "To score at Hampden was unbelievable," Chipolina said of Lee Casciaro's equaliser in Glasgow. "It was the most amazing experience we have all had. I don't know how many times we have seen the goal since." Gibraltar host the Scots at Estadio Algarve in Portugal having lost all nine of their Euro 2016 Group D qualifiers at the cost of 50 goals. But they also scored their first competitive away goal in an 8-1 defeat in Poland. "Hopefully we can build on that and I am sure one day we will see better results," said the 32-year-old Chipolina, the defender who plays with Gibraltar champions Lincoln Red Imps along with half the squad. Gibraltar had Scotsman David Wilson as caretaker at Hampden after Allen Bula's dismissal as head coach. However, the former Kilwinning Rangers player has since been succeeded by former Brighton and Hove Albion manager Jeff Wood. The 61-year-old Englishman also thinks the Scots will face an improved side. "Obviously, when we started, it was a big culture shock," he said. "To be playing Germany, Poland, Scotland, Ireland and Georgia wasn't going to be an easy start. "We have made progress, not in actually getting a point or winning a game but in the way we have gone about trying to get teams to change their system to try and stop us playing." Both squads were prevented from training on the pitch on Saturday because of heavy rain. "It was a precaution so that it didn't cut up," said Wood. "Having been on the pitch, it is fine. "If we were going to train and then Scotland, would it be repaired by tomorrow?" Wood does not expect his side to face a dispirited Scotland, despite Gordon Strachan's side having failed to quality after Thursday's 2-2 draw with Poland. "No, Gordon and the players are too professional for that," he said. "They have players who play in the Premier League and they obviously want to do the best they can every single game. "Seeing the game, I think they were unfortunate the other night. "I would have liked Scotland and Republic of Ireland to go through because I know people in both set-ups."